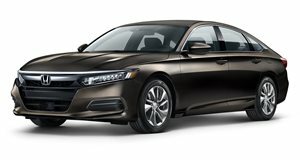 The Accord range comprises five trims, with the base engine on all but the Touring being a 192-hp 1.5-liter turbo-four mated to a CVT transmission. Standard on the Touring and optional on the Sport and EX-L, a 252-hp 2.0T engine is available with a 10-speed automatic gearbox, while the Sport gets a no-cost option of a six-speed manual gearbox for both engines. The $23,720 LX is basically equipped with cloth upholstery, 17-inch alloy wheels, LED exterior lighting, dual-zone climate control, and a seven-inch infotainment system with four speakers. The $26,180 Sport gets 19-inch alloy wheels, Android Auto and Apple CarPlay functionality, an eight-inch infotainment display, and 12-way power driver’s seat adjustment, along with bespoke interior and exterior trim. The $27,620 EX, based on the LX, equips the Sport’s infotainment system, a power sunroof, heated front seats, blind spot monitoring, and satellite/HD radio capability with an additional USB port, while the $30,120 EX-L adds leather upholstery, power front passenger seat adjustment, driver memory function, and a ten-speaker audio system. A range-topping Touring trim, at $35,950, gets 19-inch wheels, adaptive suspension, a head-up display, ventilated front seats, heated rear seats, a Wi-Fi hotspot, and wireless charging.